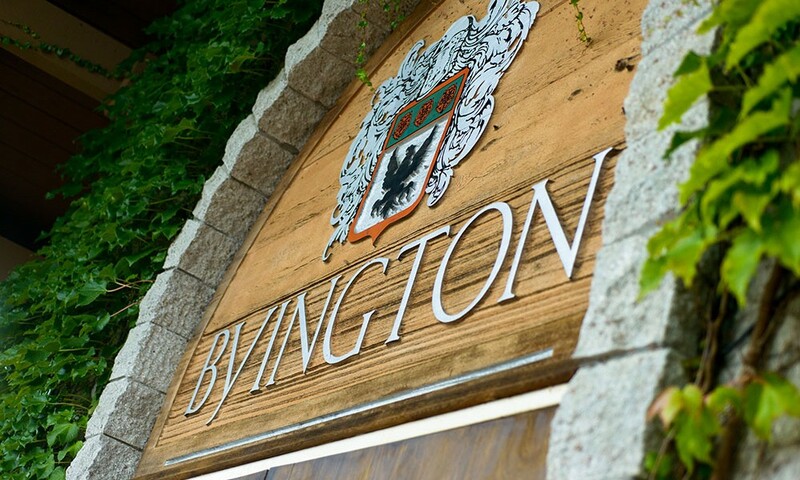 Byington offers exceptional experiences in a spectacular setting to best fit the needs of your event. 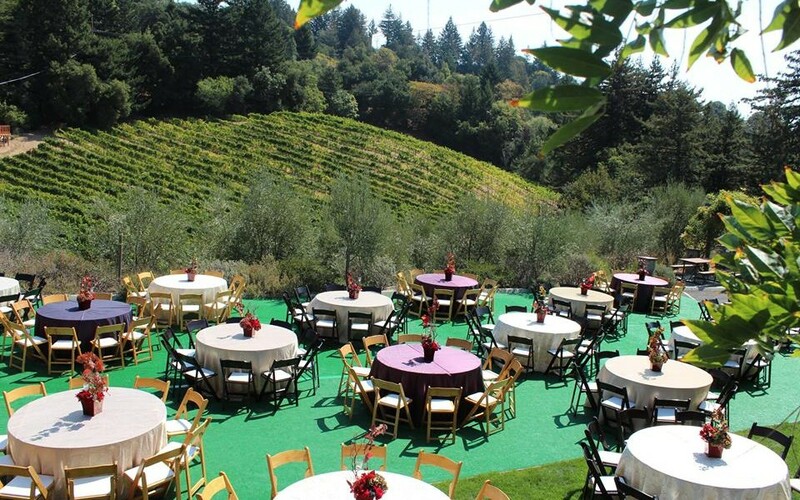 Whether celebrating a corporate milestone, the launch of a new product, or hosting the ultimate holiday party, Byington provides a memorable venue among the beauty of the Santa Cruz Mountains. For an urban setting, we offer our Los Altos Tasting Room. Create a memorable event in one of our exceptional settings. Accented with hardwood floors, French doors, picture windows, high-beamed ceilings, and a stone fireplace, this majestic room creates the ambiance. The VIP Room opens onto a large, wisteria lined veranda overlooking one of our Pinot Noir vineyards and the Monterey Bay. 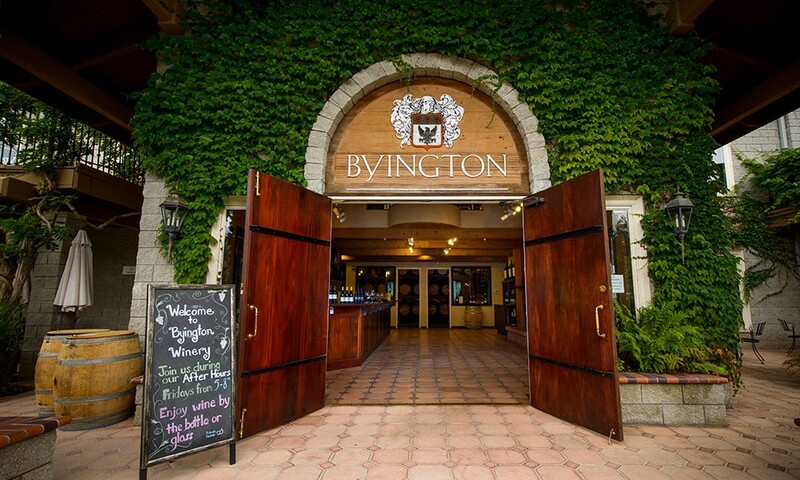 This room provides the unparalleled experience of enjoying your meal paired with Byington wine amid the very barrels where our wines are crafted. With an amphitheater-style view of our vineyard and surrounded by majestic redwood trees, this space is the epitome of Byington. Our grand Wine Cave doors are the backdrop to your event. With beautiful folliage and elegant plantings, this setting has great views of the Monterey Bay and our Pinot Noir vineyard. Our Bocce Ball court is amid our vineyard and will complete your experience. Located at the edge of our property, this patio was constructed to provide breathtaking views of the Santa Cruz Mountains and the Monterey Bay. This intimate space is located next to our Block 4 Pinot Noir vineyard and among our estate’s redwood trees. Arrive at this spot by foot or enjoy a ride in our open air guest bus. Head up to scenic Wedding Hill, walk straight through it, then descend the path to the far left. You will see our Block 4 Outlook with incredible views of the forests of the Santa Cruz Mountains. Descend the patio to find the trail head. This is a rigorous hike taking fit folks approximately 45 minutes to complete. Please wear appropriate shoes and bring water. Los Altos Tasting Room is a combination of tasting room, wine bar, wine retail, and private and corporate event space. 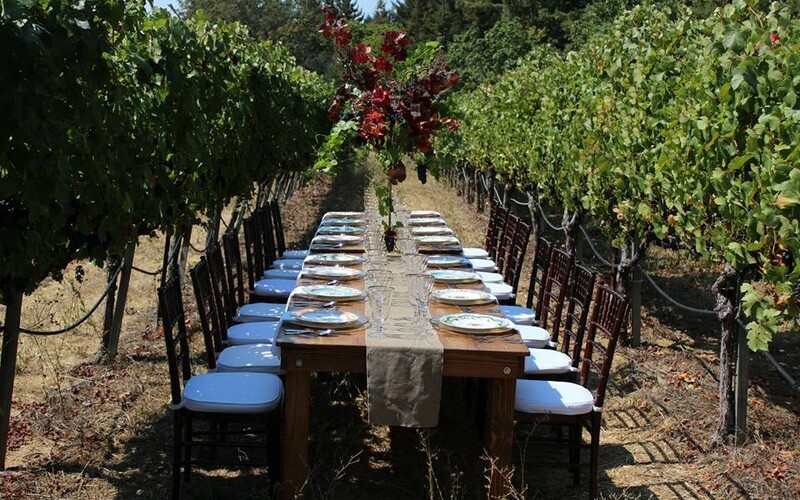 It is a popular venue for life’s celebrations, business luncheons, meetings, wine tasting, wine blending, and other wine experiences. 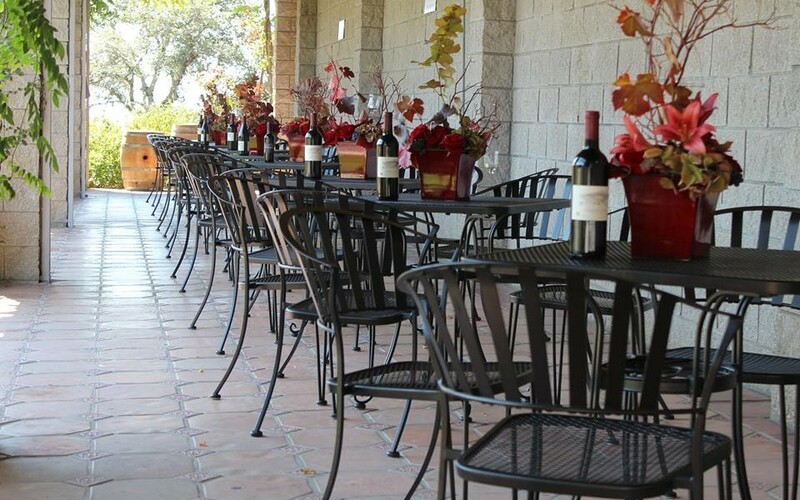 Later in the day, our tasting room provides an alternative to late afternoon cafes for meetings, and a great place to stop for a taste prior to dinner, purchase a bottle for dinner at a favorite restaurant, or join after dinner. Our Signature Packages are listed below. Additional packages can be tailored to your specific needs. See our offerings immediately below, followed by details for each. This event is perfect for enjoying a lovely afternoon of socializing outdoors on our beautiful front lawn. Guests are welcome to explore our unique hiking trail and play a game or two of Bocce Ball. This package includes Winery Tour and Tasting of five wines including access to our exclusive Wine Cave and a choice of catered lunches. This offering is available year round and may be covered or brought inside in the event of winter weather. Engage in some competitive, team-building fun while tasting three varietals used to craft blends. Groups create their own blend, label, and sales pitch. Enjoy a cheese plate while participating in this two hour activity. Please contact us about your important Corporate Event. Indeed, we had lots of fun. 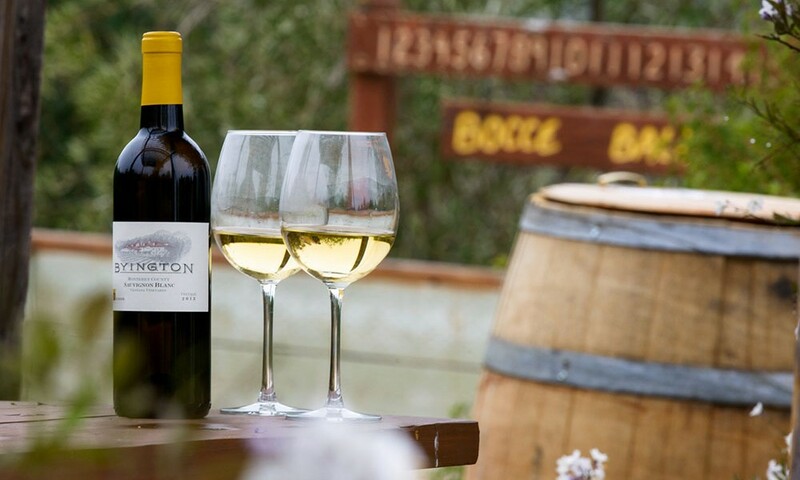 Everyone in the team enjoyed the most relaxing experience at Byington Winery. The short hiking trail was awesome. Overall it was a great experience. I am happy that the team had a truly relaxing time. It was a good break from the busy work life! Thanks to your Tasting Room Manager, who was very helpful & accommodating. Thank you again for hosting us. On behalf of our company, I want to thank you and your staff for a memorable event. Vince, our guide, really made our event special. He was very knowledgeable and entertaining. The vineyard was beautiful and the wine was exceptional. We purchased many bottles for our next happy hour. Our staff really enjoyed themselves. I can’t wait to visit Byington soon. The event was lovely!! Your staff was helpful, polite, and the tour guide was particularly fun to listen to. Your winemaker very much impressed our top level executives, and many bottles were bought per his thoughtful suggestions. We really appreciate you working with us to allow us to use our special celebration wine labels. They make great collectibles for our team members and we even brought one back for the President of our company! Thank you so much for hosting us! We do hope to be back. We had a blast. Thanks for coordinating everything for us within a short notice. Your staff were really helpful and nice with all the group. We had the best winery tour ever thanks to Vince. Everyone loved it. And your Events Coordinator was really attentive.. Thank you so much for a wonderful event today at Byington. Our group already was talking about returning next year and spending more time at Byington! Thanks again for your excellent customer service and help. We all had a lot of fun, and it was just what we needed after a week full of meetings and various brainstorming sessions. The activity gave us a chance to use our creative minds to think out of the box and apply to something really fun like wine making. I wanted to tell your winery staff and the chef, thank you - the dinner was fabulous, and we all learned so much! The wine tour was great. They gave us quite the insight on your winery, and then tasting the awesome wine was the true test. We had so many comments from our attendees on the ride back about how insightful and knowledgeable everyone was. Thanks again, and it was again without a doubt, wonderful. The Events Coordinator and her team are wonderful, very responsive people. Their customer service is excellent, and you can tell that every activity that we had was well thought of and planned and well orchestrated. It was a very successful event. I highly recommend taking the beautiful drive to Byington. The views are amazing from this gorgeous property, and the wines are terrific! This is a perfect venue for a corporate event - great for picnics, friendly staff. It's one of the very few wineries where you can witness the winemaking process from vine to bottle.